Wilson’s report set out a series of recommendations on how to handle these men upon their return home at the end of the Second World War. The eventual result was to be far-reaching: a programme of Civil Resettlement Units (CRUs). Largely forgotten about, this programme was one of the first controlled experiments in social psychology, an early example of ‘therapeutic communities’ and is notable for its humane treatment of returning service personnel. It is also potentially instructive for society today. The issue of the rehabilitation of POWs first came to the War Office’s attention in the middle years of the war. Distinguished soldiers from the Great War wrote to the War Office, recalling how they had never fully recovered from the psychological effects of captivity. Their observations were matched by events from the current war. 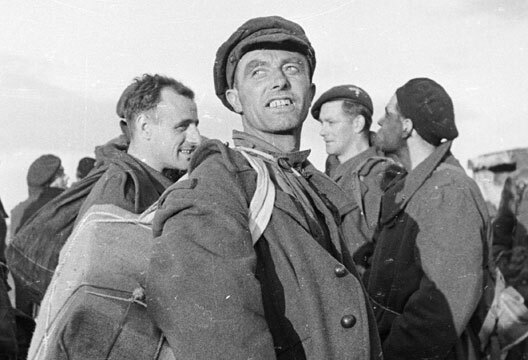 A survey by the army in May 1942 revealed the difficulty it was having in rehabilitating and employing escapees and other ex-POWs recently repatriated from Italy in an exchange of sick and wounded POWs and protected personnel. Another investigation, carried out by army psychiatrists on 100 ex-POWs who had returned around the start of 1943, showed 30 per cent of them were exhibiting ‘some degree of abnormality’ three to six months after their release. To try to understand more about these problems, the government established an experimental rehabilitation scheme at the Royal Army Medical Corps (RAMC) Depot in Crookham, near Aldershot. The scheme ran from November 1943 to February 1944 and included more than 500 returned regimental stretcher bearers and almost 800 RAMC personnel. These POWs were observed to have developed a ‘stalag mentality’, disproportionately severe in those who had been prisoners for more than 18 months. Features of this included ‘a very real but unfounded feeling that their physical or mental health had somehow been damaged’, which was related to ‘depression and guilt’ suffered whilst in captivity, and to ‘anxieties of re-adaption’. Around this time, articles written by ex-POWs on the consequences of captivity appeared in the press. Captain George Collie, who had escaped from a POW hospital in Paris in 1942, penned an article for The Fortnightly magazine on the ‘Rip Van Winkle’ effect. He explained how thousands of men captured at the fall of France had ‘no conception of life in Britain to-day or of the changes in the outlook for the future’, and that ‘these blanks in the knowledge of events are a serious matter for the prisoner of war’. A few months later, the British Medical Journal published an article by Major Philip Newman. Newman’s escape from captivity had involved being buried for 56 hours underneath the floorboards of one of the huts in his transit camp at Rouen in France whilst the rest of the camp was being moved back to Germany in early 1942. He wrote of ‘release phenomena’, which he characterised as the psychological equivalent of ‘the bends’ or ‘decompression sickness’. Just as the deep-sea diver’s body exhibits a variety of symptoms if insufficient time is taken to release it from high underwater pressure, so an ex-POW, having gone through the intensity of captive life, would exhibit symptoms of restlessness, irritability and even dishonesty after returning home. Collie and Newman’s assessments, like those of POWs were ‘normal’ men. Their psychological problems stemmed from being removed from their natural environments. Newman described it as a ‘normal response of a normal man to release from an abnormal external environment’. As Wilson put it, ex-POWs were not ‘psychiatric cases’, but experiencing problems ‘of a special type’. The basic problems ex-POWs faced were considered to be different only in degree, rather than kind, from those facing all repatriates. POWs had been more firmly uprooted from their home society and more absolutely cut off from it than other servicemen. This was one reason why POWs received the government’s attention. There was another. During the interwar years, a perception had developed within the British public that demobilisation after the First World War had been mismanaged and brutalised ex-servicemen had been at the centre of a series of bloody riots that had swept across towns and cities. By supporting POWs in the current war, the government offered a gesture of reassurance to civilians that the same would not happen again. The observations from the current war, along those available from the First World War, led Wilson to compile his nine-page report on the ‘psychological aspects of the rehabilitation of repatriated prisoners of war’. The adjutant general personally took the matter to the Secretary of State for War. Just over a year later, in March 1945, approval was given for the creation of 20 CRUs across the country. Ex-POWs’ adjustment problems were considered by psychiatrists to be most severe during the first six months of civilian life. CRUs were residential units designed to catch men at this point. They provided a ‘half-way house to Civvy Street’; a bridge in the transition from army to civilian life. Attendance at a CRU was purely voluntary. This was essential, given that the purpose of the units was to re-accustom ex-POWs to living as civilian members of a free society. Considerable efforts were made to make POWs aware of the units. Lectures and notes were prepared for officers who went into camps at the end of the war. Pamphlets were sent to repatriates a fortnight after their leave began. Posters were produced and news coverage was carefully planned. One of the strongest factors in an ex-POW’s decision to volunteer for a CRU was his dislike of being a long way from home. As a result, units were established close to the homes of repatriates, as determined by census figures. Where possible, large country houses were used, so the CRUs contrasted from army camps, such as the Jacobean stately home Hatfield House in Hertfordshire. Each unit accommodated 240 ex-POWs at any one time. Ex-POWs entered in groups of 60 per week so the older residents could help settle in the newcomers. Generally, men stayed for between four and five weeks. The units were arranged to eliminate some of the key challenges POWs faced in their reintegration back into society. There was minimal formal discipline, allowing activities to be spontaneous and democratic, and enabling ‘flexibility and personal embellishment’ amongst the attendees. The Auxiliary Territorial Service, the women’s branch of the British Army, supplied 100 of the 140 staff members of each unit, to re-accustom POWs to a mixed community. Meals were served in a common dining room shared by all ranks, repatriates and staff, which symbolised CRU democracy. Ex-POWs were waited upon, to avoid queuing for meals; an omnipresent and hated feature of captive life. Repatriates could return home each weekend, and their wives and civilian friends were invited to attend social gatherings that took place in the unit. The objective of CRUs was not limited to reintroducing the ex-POW into civilian life, it extended to helping families and communities reintegrate returned service personnel. In this way, the two groups were ‘treated’ together in a ‘therapeutic community’. Group discussions were held to encourage men to disclose their feelings without embarrassment in the hope they could discuss their problems more openly at home. Men could be referred or self-referred to a psychiatrist: two CRUs had a resident psychiatrist whilst other units were paid weekly visits. Each unit had a female Civil Liaison Officer: a trained psychiatric social worker who dealt with domestic difficulties. Other specialists, from Army Education Corps instructors to Dental Officers, were available for consultation, but the guidance information handed out at individual CRUs placed great emphasis on these meetings being voluntary, with it being up to the repatriate to initiate contact. In all these ways, it was expected that the resistance POWs showed to authority figures, a means by which they had sustained their morale whilst under the power of their enemy, would be neutralised, and they would reconnect with home society, accept responsibility and display the initiative necessary for civilian life. CRUs also offered vocational guidance and access to the labour exchange, with the proximity of the unit to a man’s home allowing him to remain close to possible jobs. There were also workshops where men learnt skills and hobbies under trained supervision. The units existed for two years. They started closing in May 1946, with the final one shutting its doors in June 1947. At least 19,000 – 13 per cent of POWs held in Europe – attended one, as well as 4500 or 9 per cent of those captured in the Far East. The RAF established four of its own resettlement centres, which received more than one quarter of some 13,000 returned airmen held captive in either Europe or the Far East. The Royal Navy made no comparable provision. Since the Navy had relatively few POWs, it probably considered the cost of establishing dedicated centres outweighed any gain. An evaluation study carried out by the Army into the efficacy of CRUs demonstrates their success. Fifty repatriated POWs in one area, who had attended a CRU, along with 100 who had not, were ‘intensively studied’ some months after they had been demobilised. 74 per cent of ex-POWs who had attended a CRU were deemed more settled in civilian life compared with only 36 per cent of those who had elected not to attend one. CRUs also had a wider objective. Distinct from the narrow aim of ‘preventing casualties’, they sought to acknowledge and sanction the positive democratic outlook a POW had gained from his experience of captivity and sustain this in civilian society. Psychiatrists recorded that POWs believed captivity had promoted positive psychological development in them. They had become more mature, wise, considerate and self-reliant. They had experienced ‘considerable democratic freedom’ in the camps where, on their committee of representatives, a private had as many rights as a warrant officer, and anyone who failed to come up to the required standard could be voted out. Ex-POWs who attended a CRU along with those who had not were compared with a control group of 40 families who represented the civilian norm. The sample was, admittedly, small but the findings are remarkable. Ex-POWs who had attended CRUs showed ‘more adaptability and co-operativeness’ than was normal for their civilian neighbours. In contrast to adhering to conventional roles that sometimes impeded cooperation between a husband and wife, these former POWs were said to have discovered how to get the most out of relationships, and had broken the bonds of conventional restriction. There was a ‘continuum . . . in terms of the degree of flexibility and participation in these relationships’ from those had been to a CRU through to the control group, to former POWs who had not attended a unit. CRUs are noteworthy for their innovativeness, unprecedented scale as well as their results. The principles and some of the methods devised for them were later adapted and applied to European civilian refugees displaced by war. One wonders if they might have a place in Britain today. A fifth of all veterans in the UK will suffer from conditions such as PTSD, depression, anxiety and alcohol disorders. CRUs illustrate one way in which they could be helped to smoothly re-adapt to civilian life. The model also suggests a wider potential benefit. With the right support, those who have gone through the challenge of war might be able to teach something to the rest of us about the social relationships and adaptability they learnt whilst under extreme duress. - Dr Clare Makepeace is an Honorary Research Fellow at Birkbeck, University of London, and the author of Captives of War: British Prisoners of War in Europe in the Second World War (2017, Cambridge University Press). See also the review of the book. Collie, G.F. (1943, June). Returned prisoners of war: A suggested scheme for rehabilitation. The Fortnightly, No. 153, pp.407–411. Curle, A. (1947). Transitional communities and social re-connection: A follow-up study of the civil resettlement of British prisoners of war. Part I. Human Relations, 1, 42–68. Curle, A. & Trist, E.L. (1947). Transitional communities and social re-connection: A follow-up study of the civil resettlement of British prisoners of war. Part II. Human Relations, 1, 240–288. Jones, E. & Wessely, S. (2010). British prisoners-of-war: From resilience to psychological vulnerability: Reality or perception. Twentieth Century British History, 21(2), 163–183. Newman, P.H. (1944). The Prisoner-of-War Mentality: Its effect after repatriation. British Medical Journal, 1(4330) (1 January 1944), 8–10. White, A. (2016). From the science of selection to psychologising civvy street: The Tavistock Group, 1939–1948. Unpublished PhD thesis, University of Kent. Wilson, A.T.M., Trist, E.L. & Curle, A. (1952). Transitional communities: A study of the civil resettlement of British prisoners of war. In Guy E. Swanson, Theodore M. Newcomb and Eugene L. Hartley (Eds.) Readings in social psychology (pp.561–579). New York: Henry Holt and Co.